Lalbagh – Flower Show or Garbage Show? Ever since I can remember-and that means since I was three or four years old, Lalbagh has been an inseparable part of my childhood. Whether it was to just run barefoot all the way (from Sajjan Rao Circle where I used to live) and play there with my umpteen friends, or go with my family and get my dad to click pictures with his Yashica camera or to go for Ganapathi Visarjana, or for the flower show; Lalbagh was the only awesome place one could think of. Since then it has also been my dad’s place of pilgrimage literally. He is 90 now, and till a few years ago, his day did not start without his walk in Lalbagh. Over the years I moved away from Bengaluru for about a decade and then came back. But Lalbagh has become my early morning haven too –I followed in dad’s footsteps. The early morning brisk walk gives me the kick and energy to take on each day in my life. Sadly like many other areas of Bengaluru, Lalbagh also has its share of abuse. Earlier, the annual flower show was an event that I really looked forward to. But now it has become one of the most painful events for me, simply because of what it does to the beautiful park. The days during and after the flower show, fill the pristine environment with mounds and mounds of rubbish. There are not enough dustbins, there are absolutely no people to empty the dustbins as they fill up. There are stalls of every kind –some totally unrelated to the environment or gardening or agricultural products. There are stalls which contribute to the show only in terms of the non-biodegradable rubbish they generate. The people who come to see the show –the less said the better – litter, litter everywhere – seems to be their mantra. On one hand people are going into raptures over the beautiful flowers and the greenery of the park, but on the other hand they are totally insensitive to their duties as sensitive citizens and throw rubbish anywhere and everywhere. This incidentally is the scene even on weekends and on public holidays when there are many visitors to the park. I would particularly like to draw attention to the ‘food court’ that comes up closer to the Siddapura gate of Lalbagh. The stink that emanates from the place is unbearable. The stall owners live there during the show and though this year we did see a few mobile toilets, there was a pool of rainwater, and sewage around it. Even today, the stinking mound of rubbish that they threw there is still there and its been more than a month since the flower show happened. The regular walkers also contributed to the rubbish by patronising the coffee stall that sprang up and without a thought, drank the coffee and threw the plastic cups outside the dust bin and walked off. This year I walked around different areas and found to my dismay that even one week after the show many of the rubbish mounds remained there. And we have lofty statements made about “beautification of the Lalbagh!” The first thing one would have thought about when planning the flower show would be to estimate the average footfalls to the show and of employing a whole army of sweepers and cleaners and equipping them with small, soundless [probably solar powered] eco-friendly, covered mobile autos to collect the rubbish everyday. 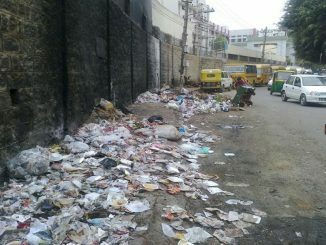 Garbage accumulation is Bangalore’s big challenge right now. Also, packaging and plastic items are increasing BBMP’s waste disposal woes. 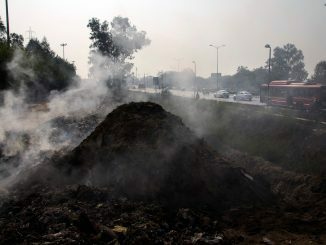 Why does the garbage crisis keep rearing its ugly head time and again? Unless garbage tenders and the SWM policy are in sync, there could be no end to the crisis in Bengaluru.